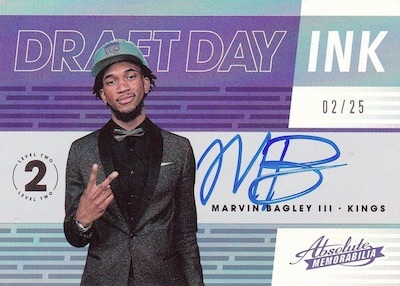 Celebrating 10 years of NBA trading cards, 2018-19 Panini Absolute Memorabilia Basketball sticks with the revamped, six-card-per-box format. 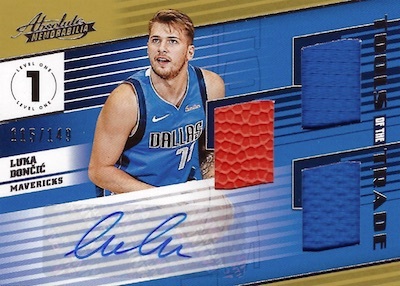 Containing two each of autographs, memorabilia cards and base cards, this average Hobby box output matches the 2017-18 product. 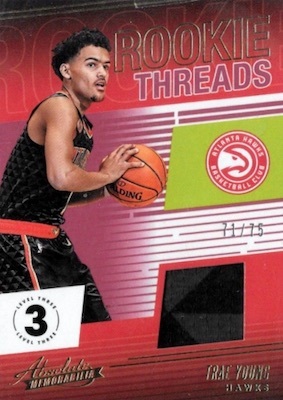 Although it is not a base set like most would expect, 2018-19 Panini Absolute Memorabilia Basketball contains two Uncirculated cards in each box, with the breakdown being one veteran and one rookie subject. As the name indicates, these come slabbed. The 100-card set is treated to new Gold parallels, as well. Other options that don't fall into the autograph or relic department include the Glass cards with 25 top current stars and incoming rookies. These are likely to be issued as redemptions. 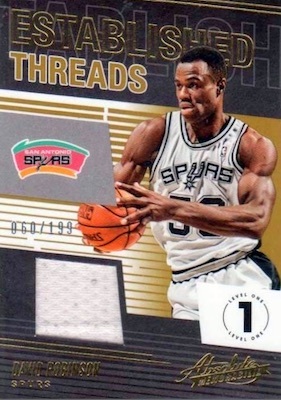 Making good use of the memorabilia aspect, the established Tools of the Trade set offers 30 first-year players spread across multiple versions in the 2018-19 Panini Absolute Memorabilia Basketball checklist. Iterations include Tools of the Trade Three Swatch Signatures, Four Swatch Signatures and Six Swatch Signatures, with the relic pieces taken from basketballs, hats and jerseys. 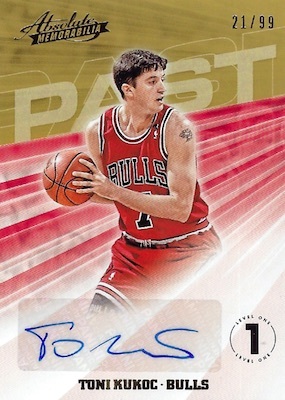 In addition, on-card content includes Rookie Autograph, Draft Day Ink and the new Hoopla Signatures and 10th Anniversary Autographs sets. PARALLEL CARDS: 10th Anniversary #/10, Maroon #/7. 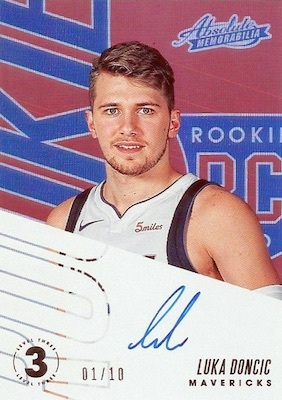 Buy 2018-19 Absolute Basketball autographs on eBay. 8 cards. Serial numbered #/20. PARALLEL CARDS: Level 3 - #/10, Level 4 - #/5, Level 5 - 1/1. PARALLEL CARDS: Level 2 - #/25, Level 3 - #/10, Level 4 - #/5, Level 5 - 1/1. PARALLEL CARDS: Level 2 - #/25 or #/15, Level 3 - #/10, Level 4 - #/5, Level 5 - 1/1. 35 cards. Serial numbered #/125. PARALLEL CARDS: Level 2 - #/149 or #/75, Level 3 - #/75 or #/49, Level 5 - 1/1. 49 cards. Serial numbered #/10. PARALLEL CARDS: Level 2 - #/149, Level 3 - #/75, Level 4 - #/10, Level 5 - 1/1. View the full 2018-19 Absolute Memorabilia NBA checklist spreadsheet. And the usual Panini BS continues: no checklist on the day a product releases. What a joke. 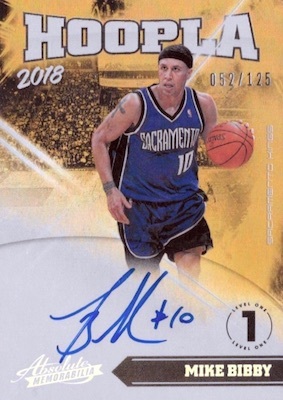 Can they just eliminate Veteran auto and memorabilia? Other than a handful of veteran stars, the cards are pretty worthless. Yes, regular jerseys and no name veterans should be LEVEL 0 ! Opened a case of this one and here are my findings for 6 cards in each box (2 uncirculated base, 2 jersey cards and 2 autos) for a total of 60 cards in case. 1) Design – average. Base was good but not great. The uncirculated slabbed card makes it both good and bad. Good it is untouched but bad it is too thick and really doesn’t add value to the card. 2) Collation – below average. 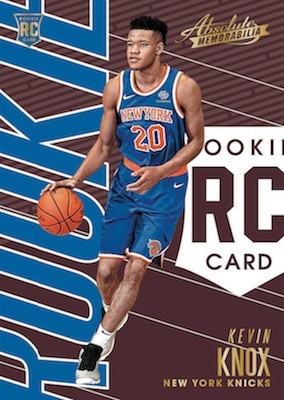 I opened a whole case and the best auto was Kevin Knox. Didn’t even get a great hit, but on average it was a lost. 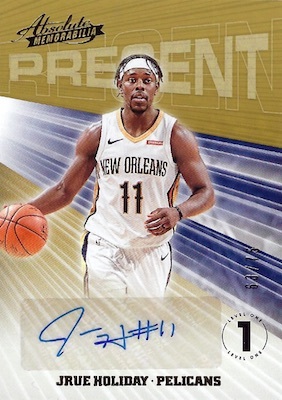 For the base collection, it was worst since I keep on getting JR Smith for most of Panini products and almost of the RCs base I got were not even in the top 10 picks. 3) Jersey – below average. Most of the cards I got were the exact same cards. 2 Wesley Matthews jersey cards, 2 Ryan Anderson, 2 Gortat, 2 Enes Kanter (Please Panini never include Kanter or JR Smith in your future sets ever. I would even pay you money not to include and destroy their cards). 4.) Autos – below average. They are sticker autos. Past & Present were ok as a concept. But the player selection were terrible. Enes Kanter again! Dion Waiters, Derrick Favors. Why not just use All Stars or just top players from each team. 5.) 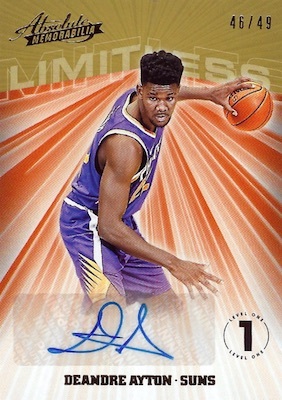 Hits – Best Hit Auto Kevin Knox, Gold Base Porzingis and Damian Lillard glass. For buying the whole case and got only this, my wallet is crying for a refund. Overall: below average product. You may try a box or two at maximum and only at discounted prices below $100. It is not worth spending for sticker autos.